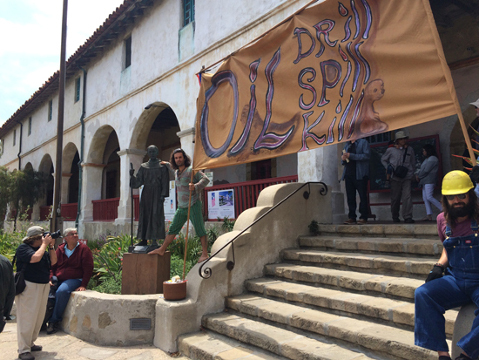 We were involved in a protest yesterday at the Santa Barbara Mission to memorialize the ocean and sea life currently suffering from the oil spill on the Santa Barbara coast. This tragedy highlights humanity’s need to move to clean energy sources immediately. 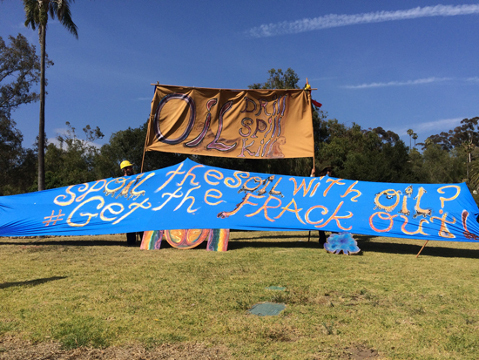 We strongly oppose fracking and its contamination of groundwater, which is so precious especially in Southern California. Our research indicates that free energy technology already has been developed numerous times on Earth, only to be suppressed by the old system. These revolutionary technologies deserve to be shared with humanity. We look forward to the day when clean energy can be extracted easily from the source field, allowing the Earth to be cleansed and many of humanity’s daunting problems solved. On another note, we chose the Old Mission as our protest site to bring awareness that these sacred Chumash grounds are still occupied by the same powers that originally enslaved the native people. The photo below is of Junipero Serra standing next to my friend Jacob Christenson, who is holding the sign with me. We feel that the recent Catholic consideration of Junipero Serra as a saint is an undignified move when the lives of the Native Americans who suffered under his hand are put into consideration.